So what is it that prevents an individual from becoming successful, happy, wealthy, famous, or self-sufficient? What obstacles lie in the way of our biggest dreams? The real reason isn’t the current head of state, the scheming of some shadow government, the ill will of detractors, nor any of the other negative factors we love to blame for our lack of fortune. The real reason is us. And a large portion of that self-imposed barrier is there because of how inefficiently we use our single most valuable resource: time. So how do we spend our time? Most people don’t actually give this much thought, by which I mean analyzing in detail how they spend invaluable minutes, hours, and days. When you really think about it, that’s a fairly careless way to treat a resource as finite as time. On top of that, the further we travel on the path of life, the harder it becomes to use time with maximum efficiency, as we inadvertently become victims of the law of diminishing returns. However, time management is a challenge encountered by every single individual who sets out on the path of self-development and change. How effectively we solve this problem in turn decides how successful we are in our efforts. The first step here is to perform “time cleanup.” Specifically, this means removing as many “time killer” activities and habits from your daily life as possible. 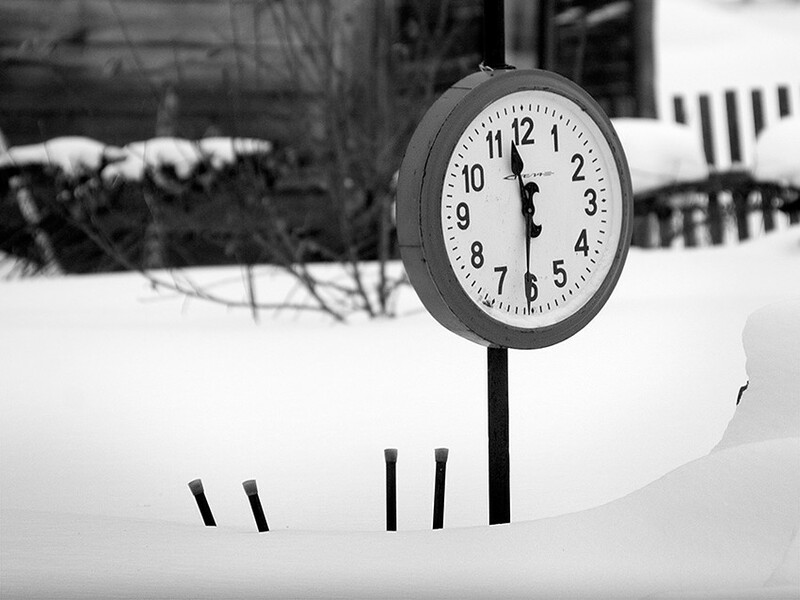 These sorts of time-wasting actions consume vast amounts of time and energy but do very little for the progress you make towards your goals or for the development of your inner self (or outer self, for that matter). In other words, in performing these kinds of activities, you are outright wasting time. No two ways about it. There are many such activities, so I’ll only cover a few of the particularly extreme time killers, defeating which will help you free up truly meaningful amounts of time. Far from the only one, but a particularly sinister category of time killers is related to modern technology and the myriad devices and digital media that have either introduced new ways of wasting time or replaced old ones. Now for an incomplete list of some of the most common offenders. It would be wrong to claim that all of these activities are total time killers. Some can actually become useful resources for self-development. The real question is how much time we devote to such activities and how we go about engaging in them. Oftentimes, the challenge isn’t to completely abandon a habit but to minimize it. To put things in perspective, let’s traverse this list point-by-point. Many people all around the world spend, frankly, absurd amounts of time on video games, receiving in return practically nothing of any positive value for their health, success, or personal development. Video games allow us to escape the real world and replace it with a much more vibrant and comfortable virtual world. The catch, however, is that we still live in the real world, and that virtual world that’s so exciting and inviting in no way affects our real life present or future. I experienced the tangible impact of video games on our lives firsthand some time ago when attending a friend’s birthday party. The gathering consisted of about ten guys, all over the age of 30, some married and with children, and many of whom I’d not seen in a while. After a round of drinks, we got to chatting about typical “manly things.” Now, half a century ago, that would’ve meant sports, women, money, and politics. But at this party, full of representatives from my generation, practically all the topics of discussion revolved around online gaming communities, leveling up in the latest MMORPGs (World of Warcraft is still around, as it turns out), and other such things from the plains of cyberspace. Some had even found jobs with less hours just to be able to spend more time on gaming. This may sound like harsh criticism of a popular hobby, but at a certain point, an entertaining pastime becomes a time killer, and this was definitely one of those unfortunate cases. Yet another sign of the times. Many people can’t imagine their lives without social networks, spending hours and days scrolling through feeds, leaving comments, and otherwise interacting with arbitrary people of no consequence. Of course, social media can be used for good, and it can definitely bring people together in ways that were impossible before, but just as with the aforementioned example of video games, crossing a certain threshold of time (I would say about half an hour per day) morphs this modern digital pastime into a time killer as well. Keep in mind that this doesn’t relate to the way professionals who run businesses use social media for marketing purposes, but entirely to those who spend excessive amounts of personal time on it. The latter, by the way, often become prey for the former, getting drawn in by all sorts of social media campaigns, which aim to divorce you not only from your money but from you time as well. These types of trending content often end up pushing actually viable, educational content down into obscurity, which makes social media a trap for many of those who don’t actively seek out specific content for use in improving themselves and their lives. YouTube, Netflix, and all the other online video distribution services actually have a vast selection of useful content, which is, unfortunately, severely underwatched when compared to the most popular online video content. Modern statistics are showing that people as a whole are moving away from television and towards online video consumption, but the fundamental problem of wasted time doesn’t go away with the substitution of the medium in question. Sadly, a large number of modern blockbusters simply destroy two hours of our time, giving us back nothing of any real use, and not even leaving us with much in the emotional impact department, except maybe some slight visual stimulation from the abundance of special effects. That isn’t to say that cinematography is dead and movies should be forgotten. However, it certainly does pay to pick and choose which films to watch and which to pass up. Every now and then, even Hollywood still manages to produce extraordinary films that affect us on such a profound level that something inside us changes for the better. Similar productions can be found from the indie movie scene and various international sources. These types of blatantly exploitative publications are a typical category of time killers that rely on most people in developed modern nations being able to read. Of course, what they don’t tell you is that simply reading is not the same as being spurred to think and comprehend the things you read. Consumption versus enlightenment, as it were. Such publications hold no real artistic or cultural value and are titled in a sensationalist manner to lure in readers, many of whom simply won’t have the level of introspection necessary to discern a lack of meaningful content (not that there’s anything wrong with having a guilty pleasure, but again, the amount of time spent consuming such materials is the key factor here). “What’s so terrible about keeping appraised of the news?” you might wonder. Keeping appraised of the happenings in the world is plenty beneficial, of course, yet again, only in certain amounts. I imagine you’re starting to see a pattern here. Let’s say you like to keep track of the news multiple times a day, including the most breaking and sensational items, which tend to also be the most negative or outright depressing. Now ask yourself, what benefit does that bring you? Whatever your argument may be, there’s no denying that news ends up consuming minutes, hours, and days of our lives if we don’t properly compartmentalize its consumption. Here, I’m not just talking about the old meaning of the term. Whether it be literal small talk with friends, or indirect communication on social media, or even idle texting, these are all time killers. Note also that because a dialogue requires at least two parties, these time killers are particularly efficient, with each killing time for more than one individual. Sure, socializing can be relaxing and often serves as a good way to unwind, but only up to a certain point. I once had a colleague who really loved to talk. Every call with him was a nightmare scenario. Barring the discussion of some serious problem, how long should a typical call last? Maybe a few minutes? Well, this fellow just couldn’t draw the line. Each time, it was like a dam shattered, and his stream of consciousness just poured out without end, forcing me to sometimes end the conversation rather abruptly. Sadly, this was one of the major reasons I ended up severing both professional and personal ties with him. But what could have been, had he attained some self-awareness on this often ignored topic. Not to be confused with political discourse, which is actually a model worth emulating, as it occurs only in specially prepared locations, at specifically designated times, and often following a strict format. Interpersonal political discussion, on the other hand, is the kind of activity that begs the previously posed question: what, exactly, is the benefit here? The unfortunate reality is that we often talk up a storm about our plans and aspirations, and in a sad twist of fate, that talk ends up making us feel like we’ve already accomplished something, so we end up not taking any or enough action to actually reach the goals we were so fervently talking about. Of course, there are those who have a gift for orating. Well, for those among my readers who do, I’d recommend going into politics or some other social field. Couple that professional direction with self-development, and help others do the same. In the end, you’ll be benefitting yourself, others, and the entire world around you, and you’ll feel great about it. While it may be a decent way to relax on the weekend, some people take their sports too seriously, becoming outright fanatics and thus crossing over into time killer territory. Many a time I’ve observed gatherings of friends and colleagues where the primary discussion revolved around their favorite teams and players, the latest sports news, forecasts, and even outright gossip. Meanwhile, time was flying by. Add to all this sports-based socializing the actual act of watching said sports, and you have a real time murderer on your hands. Those participating in sports – the actual players – are certainly successful, wealthy, and influential. They’ve achieved a lot by working hard, and I guarantee that they value their time immensely and put real effort into learning how to manage it properly. So think for a moment: what is it that’s stopping you from doing the same? A true time mass murderer, this culprit is also a master of hiding in the open. It can kill years or even decades of your life, not giving anything in return except health issues and a feeling of emptiness. Many a book has been written about what causes such stagnation, but it all comes down to fear, laziness, apathy, fear of responsibility, and lack of clear goals. All the while, real change is just around the corner, and should you find the strength of will and clarity of mind to start walking down that path to success consistently, your life will flourish like never before, even if not immediately. Whether it’s starting your own business, switching jobs, migrating to an entirely different professional field, or getting a higher education (first, second, or even a third), there’s a whole list of potential options waiting for you to make a decision and follow through by assigning more importance to that pivotal life choice than to your fears and other negative sentiments. The bottle is a serious, sinister foe for anyone with the aspirations to achieve something in life. We’ll likely never know the true number of success stories and lives in general destroyed by this particular vice, but the fact is that it claims new victims every day. Drinking can and will form an addiction at an alarming rate, which, once established, tends to utterly decimate efficiency, productivity, and all proactive initiative. Just about the only benefit to consuming alcohol is a temporary feeling of euphoria, and even that goes away if you drink too much. Sure, the liquid substance in that bottle might temporarily silence your problems, but it won’t do anything to help resolve them. On the contrary, it often just makes things worse. Regular consumption of alcohol has a number of more physically tangible downsides too. Considerable reduction in productivity, sometimes for the entire day following the act. Worsening memory, and an overall reduction in mental clarity. Constant expenses (a look at the alcohol expenses in your budget can sober you up quick). Yet again we come to the pivotal question: is it worth it? For many, alcohol acts as an escape from reality, not unlike the video games mentioned way above, despite how drastically different the two activities may seem. But there is an alternative path. You can change your reality instead of escaping it. And that’s exactly what we’re going to do throughout the rest of this book. Along the way, we’ll either minimize or altogether destroy any of the time killers mentioned above. 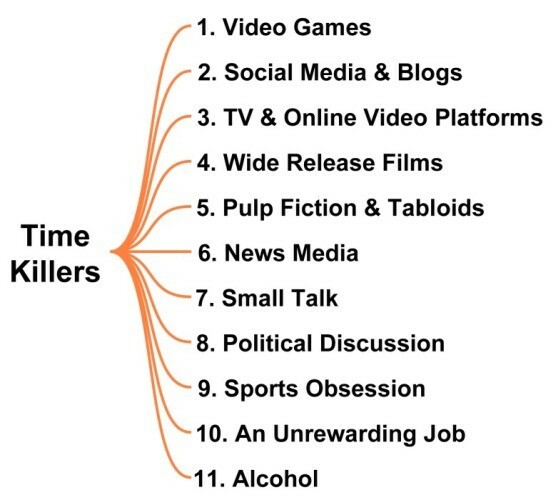 The list of “time killers” can certainly be extended to cover many other less-than-productive activities. Some are common to most people, while others are “time hitmen,” which take a personal approach to your time. All in all, the best way to battle these time killers is by turning your gaze inwards and analyzing both your work and leisure to figure out how beneficial the various activities you engage in are for you. Support the building of a brighter future. Have no positive effect of any kind (i.e. wasted time). Be honest here. That’s the only way this will work. All the activities that fall under the third category are guaranteed to be time killers, which prevent you from making categorical changes in your life. As such, it’s important to start working on minimizing their impact on your day-to-day routine. You’ll be able to use the time you free up on much more beneficial things for yourself, your loved ones, your country, and the world as a whole. And don’t think that last part is hyperbole. As the commonly paraphrased saying goes, today is the first day of the rest of your life. Our lives consist of those very days, which add up over time. Some have tens of thousands of days still ahead of them, while others have fewer. So pay attention to your life by paying attention to your days, and they will no longer drift away from you without you realizing it. Now, let’s take a look at the other side of the coin: good habits.